The Sands and McDougall South Australian Directories are a valuable resource for local, family and social historians as well as for researchers in other fields of Australian history. The directory contains street, alphabetical and mercantile directories. 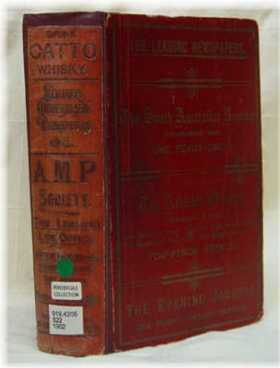 It also incorporates the Boothby's South Australian directory and a directory of several Northern Territory towns. This directory includes government, official, ecclesiastical, legal, pastoral, municipal and miscellaneous information on the state. This is a valuable genealogy tool for researching Australian history making information that is difficult to find plainly and easily accessible, and perfect for anyone exploring their family history or building a family tree.